'Went this week with friends to the Bronte’s home: The Parsonage in Haworth in Yorkshire. It is incredibly well preserved; a real time capsule, with furniture, personal possessions and décor all still in place. My first reaction was a kind of connection to the Bronte’s former presence, to their ‘ghosts’, not that I believe in such things; what I means is that having read some of the books and knowing their story, at least in outline, being so close to such intimate things gave an intense sense of personal connection, almost as if one knew the family personally. But after a time, walking from room to room and picking up on the atmosphere of the place, I got this awful sense of repression and privation. The clothes – mostly Charlotte’s – were tiny, and one was forced to realise just how little they owned and ate, even though this was a reasonably well-off family, with a parson’s income and the use of a servant. This led to thoughts of how little peasants and workers owned and lived on. We know, of course, that starvation was a reality for many in those days, and waste was an anathema even to the better off. There was a ‘smallness’ to everything. Hand-written texts were absolutely tiny, presumably to minimise the use of paper, whilst still giving the fullest expression to feelings and observations. Subjugation to religion and what was considered ‘proper’ in interpersonal and public behaviour seemed evident throughout the parsonage and its contents. And of course, the Bronte siblings all died young; some very young. It put into sharp relief the way we live now. I would not want to go back to their way of life, but it did point up, by contrast, contemporary lifestyles as decadent and overindulged, and my mind wandered to the preponderance of overweight and obese people in our society, whose condition may not even be commented on for fear of censure for failure to observe politically correct doctrines. We are big, not fat, even if we are five feet two and twenty stone, and we are most definitely not responsible for our lack of self-control and over-consumption. Looking out from the parsonage; in one direction are the bleak, windswept Yorkshire moors; in the other is the graveyard. Add to this the constant presence of disease and death, the stringent social codes by which the sisters lived and, by the standards of the day, their good level of education, their taking refuge in imagination and literature should come as no surprise. And by extension, the darkness, madness and biting social observations of their writings feel inevitable. 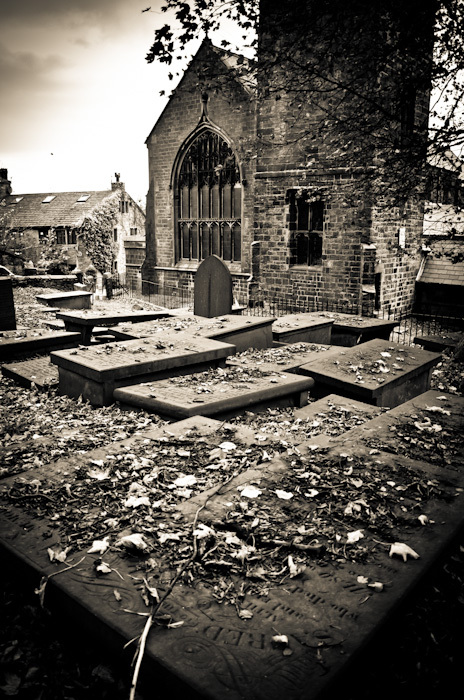 The church and graveyard at Haworth, adjacent to the Bronte's parsonage home.